Twist Shouter provides an unofficial spinner replacement for Twister by Hasbro. Twister is a game of physical skill and quick thinking. 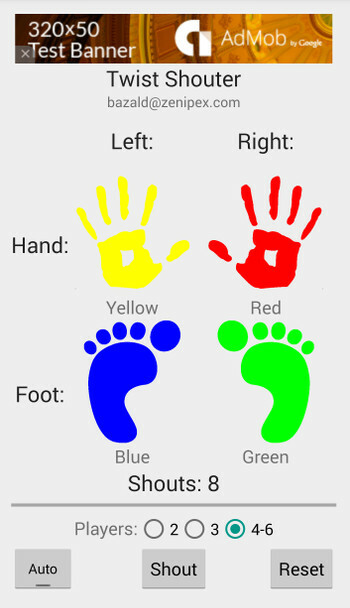 When Twist Shouter calls out a hand or foot placement, all players must rush to put the right body part down on the appropriate color as quickly as possible. Twist Shouter instantly selects a hand or a foot and a color at the touch of a button. Twist Shouter uses text-to-speech to call out moves so that someone using the app doesn't have to. Twist Shouter provides an automatic mode to allow play without someone dedicated to using the app. No sharing of circles is allowed. If a hand or foot breaks contact with the appropriate circle once it has been placed, it is a game loss for that player. If weight is placed on any part of the body besides hands and feet, it is a game loss for that player. The only way to try to force an opponent out of the game is to position yourself so that they cannot reach a circle. 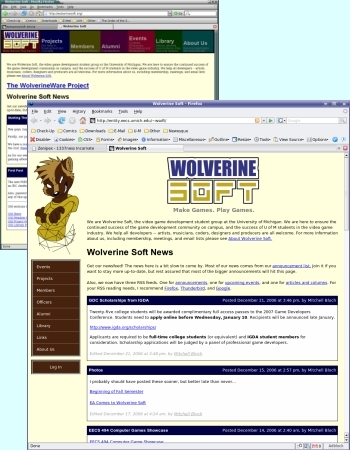 This is the website for the U-M game development group, Wolverine Soft. I received a copy of the site in plain HTML, broken in places, at the beginning of the summer. Over the course of the summer, I remade the site in standards compliant HTML. Using PHP and MySQL, I was able to make many pages member or officer editable. All member accounts are password protected. Images that are uploaded for the member pages are dynamically resized for thumbnails to be displayed on the alumni page. Projects and library items (such as articles) are cross-referenced with member accounts to make it simpler to give credit where credit is due. Calendar pages are generated dynamically using PHP and months that have events associated with them are automatically displayed on the events page. Additionally, the site now supports session management features and all edits are protected through the use of HTTPS. These changes were accompanied by a significant site redesign. 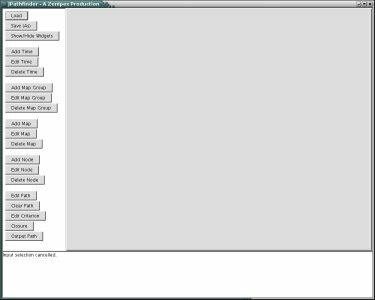 This is a java application that allows you to set time ranges (e.g. noon to 5 pm), maps (with groupings that allow you to, let's say, group all the floors of a building), nodes, and paths between the nodes. You can then find paths between the different nodes under various criteria. A demo is currently unavailable, as I have yet to get/make maps that I am certain are free of copyrights. Until then, you will have to settle for the program itself. pspm3ugen-1.0.00.cpp is a minimalist command-line program to generate PSP-compliant .m3u files in Linux. It could easily be ported to other operating systems as well. This is a frontend for FFMpeg to make video conversions for the PSP that much easier. It supports the options of 29.97 fps (vs 14.985 - the default), widescreen, multipass encoding, mono, and manual configuration of video and audio bitrates. It also generates thumbnails (.THM). Now offering volume adjustment! Amplify those videos until they aren't absurdly quiet on the PSP any more. The first version comes with a specially hacked version of FFMpeg plus the needed dependencies. Untarbzip the file, cd to the directory, uncomment any parts of install.sh that you don't want to run, and then install. This a program I originally wrote for one of the math teachers at my old high school. 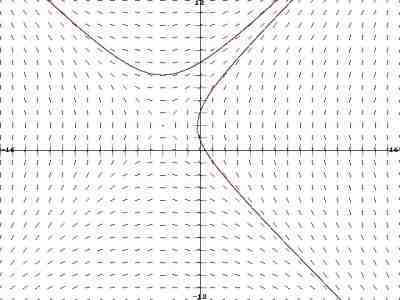 It is a fairly solid (albeit somewhat inefficient) program for generating slope fields. I wrote in in C++ using Allegro. On a sidenote, I also ported it to Linux, but I have yet to figure out how to statically link in enough libraries for it to work on other people's computers. Sorry!